If this wealthy Chinese wants to retain his gold-plated BMW, can he/she request the government to amend the colour of BMW from grey to gold in his/her car registration, instead of restoring BMW to original grey colour? On March 27, traffic police in Panjin, Liaoning Province finally caught up with the golden BMW that had been appearing frequently outside of the city's high school, and required the owner to restore it to its former color, deep gray. Around 10:20 am, Li Xiaoming and three other policemen patrolling Chonghua Road found the golden BMW X5 and they called at the car through amplifiers to stop. Instead of obeying police, the driver sped up, trying to escape. The police radioed other officers to stop the car in Shuangtaizi district. It was pulled over 30 minutes later. After taking the car and the driver to the police station for investigation, police found the golden car was covered with a thin layer of golden film, and traffic police asked the driver to restore its former gray color. He was fined 500 yuan ($79.40). 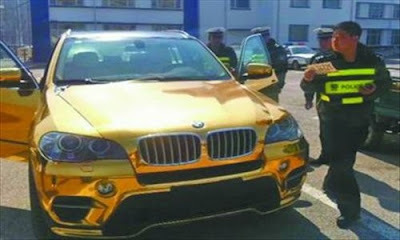 The driver said that the gold coating had cost him about 30,000 yuan ($5,000). If I was rich, I would also have my car painted in gold. I don't know how this violated any traffic rule that he had to be fined for this. ca car title transfer: Normally, the car owner has to apply to the government, to change the colour of the vehicle on the car registration card. Unfortunately, I don't know why the government in this region doesn't allow to do so. I wouldn't mind spending five grand to make my car unique. By the way, is this a BMW X5 or a BMW 3-Series sedan? As in most third world countries (China included for the simple reason that their thinking and political ideologies are, notwithstanding their "Shanghai-economy"), they will slap you with an offense to muster you to bribe them into how you can get away free. In this case, it would have been okay and just another gold car on the street, but authorities knew the guy was pretty loaded so there he is! Pay or jail. Vicious cycle. I wonder if he's loan for car became helpful. He paid a lot of money to have it painted in gold. What hurts is he also had to pay a huge amount of money in order to have it removed. I wonder if second hand cars in liverpool also offer these kind of services. I'm planning to color my newly bought second hand car and I'm hoping someone could help me. That luxury car should have an auto storage in order to keep it in good running condition when not in use. My cars has vehicle storage in delray beach and I'm satisfied with their offers. I wonder if that car has too. It's a great idea to have one. I heard this from some long island toyota dealers and I find it really a weird decision. Nonetheless, it was his choice and we cannot do anything about it. Having a used car is more convenient for me. But I would agree, this is a unique idea to have a unique car as well. I;m not sure if Buckingham drive autos offered this kind of services. A new paint job could make even second hand cars in derby look brand-new. Still, you'd have to ask permission from the local government if you wish to repaint a vehicle. I honestly don't see a problem with having a gold plated car. He could afford the paint job and it's not a hazard to anyone so this just doesn't make sense. Great tips on how to protect your car, I’ll be sure to keep these in mind the next time I clean my car. This blog Is very informative , I am really pleased to post my comment on this blog . It helped me with ocean of knowledge so I really believe this site will do much better in the future.